The training sessions are organized by Professor Bruno J van Herendael and Professor R. Van Hee at the facilities of the ZNA STER site Stuivenberg in collaboration with the departments of Ob/Gyn head Dr. Frank Sterckx and General Surgery head Dr. Leo Hendrickx. The site Stuivenberg is part of the ZNA (Ziekenhuis Netwerk Antwerpen) (fig 5). The Network groups the hospitals that were formerly known as the Antwerp City Hopitals ( OCMW) (fig 2). For gynaecology, there is an active collaboration with the department of Ob/Gyn/Fertil of the ZNA site Middelheim ( Head Dr Coppens) Dr Bart De Vree and Marc Francx. There is also a close collaboration with the university dell' Insubria Varese Italy, (fig 3) where Bruno van Herendael was Professore a contratto for gynaecological surgery and Fabio Ghezzi is Professor in charge of Endoscopy. Paolo Beretta on the hospital side worked in Antwerp for several months. On the areal photograph of the Stuivenberg site one can clearly remark the architecture from the mid nineteenth century. The turrets were separated one from the other by the garden and hence by fresh air in order to prevent the infectious diseases to spread. The first adaptation has been to connect the turrets and the last major adaptation has been finished in 1998 when the new theatres and the outpatient facilities have been added to the old frame of the hospital. 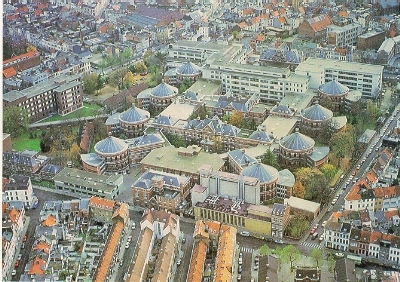 On the far left of the picture, within the perimeter of the campus one remarks the psychiatric hospital, the largest in Belgium. The site has been classified as a landmark of national interest so if the ZNA wants to enlarge or to unify its campusses in one location the board of directors will have to look for a new location. Antwerp is the largest inland sea harbour in the world and is now ranked as the fourth largest sea port in the world. Fig 4 gives you a view on the sky line seen from the left bank of the river "Schelde". Antwerp is also one of the largest centres in the world for cut diamonds. Under the impuls of the Hoge Raad voor Diamand, the city is on its way to become the world centre for gems. At this moment in time Antwerp is under reconstruction. The largest city in Flanders will emerge as a newborn city around 2010.